Group exhibition at Seacourt Print Workshop curated by Mark Graver, director of Wharepuke Print Studio, Kerikeri, New Zealand. Combinations brings together a group of artists from New Zealand and the UK with a shared interest in hybrid and intermedial approaches to printmaking and the relationship between established print media and evolving technologies. When it comes to techniques and processes printmaking has a history of adaptability and versatility - it is one of its fundamental strengths - and printmakers have always adapted their craft in tandem with evolutions in technology, often finding artistic applications where they were not necessarily intended. Combining traditional methods with developments in digital technology and print in a wider context the artists represented here acknowledge both the historical traditions and the technological advancements. 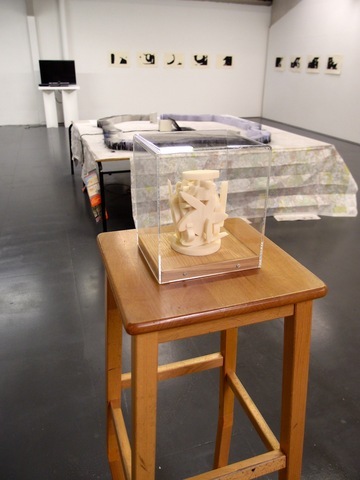 Their work is not appropriation of technology for technology’s sake but an awareness of the conceptual connections and combinations between the two and includes 3D, video, photopolymer etching and digital prints.